(Philadelphia, PA) Moved by the recent tragedy in Texas and Louisiana, Stagestep, Inc. announces a rebuilding initiative for dance studios, dance schools and dance centers impacted by Hurricane Harvey. In an effort to assist in the rebuilding phase, Stagestep will contribute 50% of the cost of its dance floor systems for venues to rebuild and get back in business. Non-profit and commercial dance companies, studios, centers and businesses are invited to apply for this contribution by May 1, 2018. This offer is valid for qualified existing dance businesses, excludes new studios and is valid on Stagestep’s dance flooring systems only. Interested applicants may apply at www.stagestep.com. 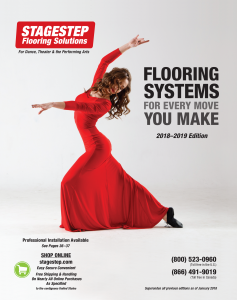 For 45 years, under the direction of Mr. Swartz, Stagestep is the oldest and largest dance floor provider in the USA, servicing the dance community since 1970.